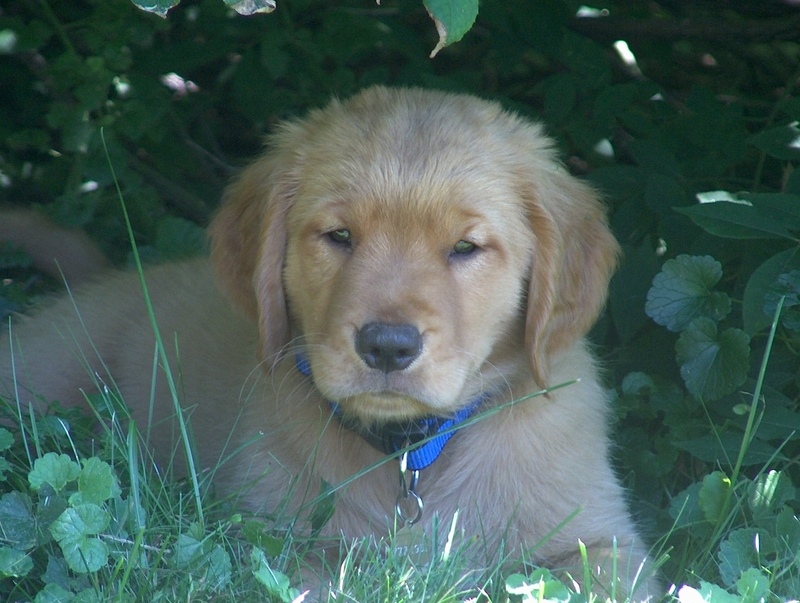 We had lived together at the farm for a couple of years when I started thinking about maybe getting a puppy. The Man never really seemed very keen on the idea for one reason or another, so when I saw an ad in the local paper for some Golden puppies just up the road, I convinced him to go for a ride and “just look at them”. When we arrived, all of the 9 puppies had just gorged themselves on their supper, and they could barely move. Those fat bellies didn’t even come close to clearing the ground, so the time was right for a nap in the noon day sun. Adorable in their slumber as they were, I started to worry about how the Man could be charmed by a puppy that had no interest in us whatsoever. That changed rather quickly, when out of the dozing pile of honey colored puppies we saw movement. We watched with amazement as this particularly round puppy slowly crawled his way towards us. With the grass a bit on the longer side, the 6 week old puppy was having trouble with traction, but he eventually made his way to our feet. As the Man scratched the exhausted pup, I pointed out that it must be fate that we should choose this puppy as our own, for he had chosen us. Before we knew it, we had handed over a deposit, along with the promise to return in two weeks to take him home. We settled on a name for him, Kody, after his handsome father, Dakota, and counted the days until our first-born arrived at the Farm. The day finally came for Kody to come home, we couldn’t have been more excited! He quickly made himself comfortable, including figuring out where his food dish was. It didn’t take us long to figure out that when he “chose” us on that first day, he had simply been looking for more food. Puppy chow was his reason for living, and if he didn’t get fed when or as much as he wanted, he would crawl under a bush and pout. Being the only dog on the Farm, he quickly trained us to meet his every need and want. Kody and the Man bonded immediately, and most evenings I would find the both of them curled up on the couch together, something they still do. It has been 9 years since Kody came into our lives, and as other pets have joined us, and others left us, he has taken on the roll of the wise old man. When my lab, Gracie, joined us 6 years ago, Kody showed her the ropes as only an older dog can. He is the Old Man on the Farm now, as his graying face and cloudy eyes reminds us. He still makes the rounds to inspect his domain every day, but his movements are slow and deliberate as he walks the rock walls bordering the fields. Food, along with his nightly couch cuddles, is still his reason for living, and we probably spoil him with treats more than we should. In the end, it is us who are spoiled, as we are given back love and affection ten-fold. Life has been busy here on the Farm the past few months, and it has been easy for both the Man and I to forget about the simple beauty surrounding us. We’ve been so focused on clearing fields and erecting fences in anticipation of our horses coming home that we haven’t ventured beyond the rock walls that border our open fields. In seasons past, it was common for us to head off into the woods that surround our home, feeling like young boys on a grand adventure, but we had yet to give in to the “call of the wood” this summer. When the Man suggested it earlier this evening, I was more than willing to grab my camera and follow him. Oddly enough, we had never walked along the rock wall that borders the north side of the property, so we excitedly headed off in that direction. The hard work we’ve been doing with the fields and fences have given me a new appreciation for every stone that was used to build these walls, and I was anxious to imagine their stories. In places the walls were as intact as the day they were built. In others, they were crumbling, and it was almost as if you could tell where one builder ended, and another took over. In the more intact areas of the wall, great care had been taken to arrange the stones like a puzzle, creating a tapestry that would truly stand the test of time. 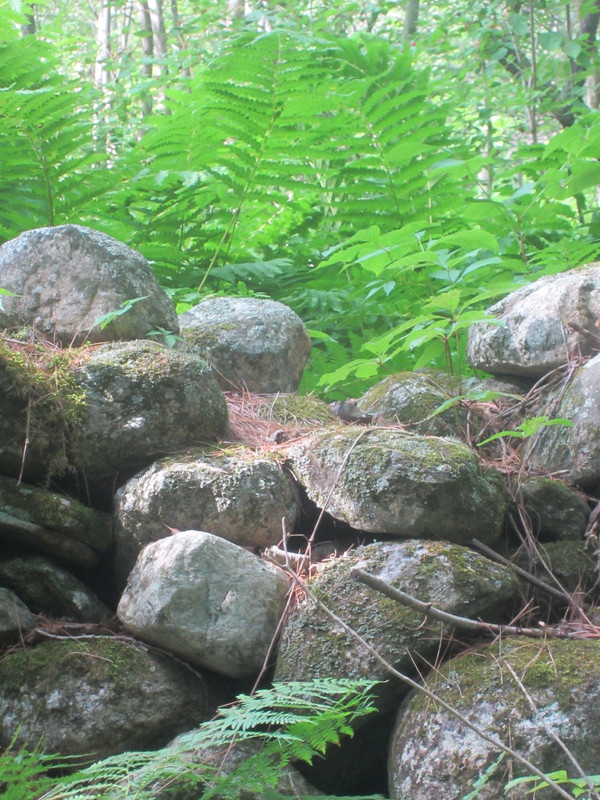 Beyond that the wall looked rushed, with loosely stacked rocks that had long since been ravaged by New England winters and the constant traffic of the wildlife within these woods. Although I was captivated by the beauty surrounding me, with the multitudes of ferns and Mother Nature reclaiming the fields, the lesson of the rock wall was not lost on me. Just as the Man and I are the stewards of this Farm, we are each given the responsibility to be good stewards in our own lives, and to those around us. The choices we make in life are like those stones that once littered the fields of the Farm. They accumulate, and the care that we use in the placement of these stones could effect those around us for generations to come. I know the occasional choice may be the wrong one, and it may come tumbling down at our feet, but even then, we are given the chance to replace it with better care.